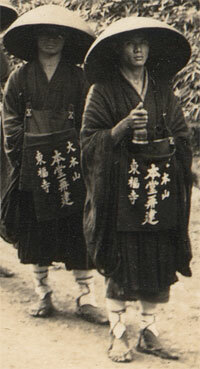 Buddhist monks walk in procession on the grounds of Tofuku-ji, a buddhist temple in Kyoto. The writing on their bags reads Daihonzan Tofuku-ji Hondo Saiken (大本山東福寺本堂再建), “reconstruction of the hondo (main hall) of Daihonzan Tofuku-ji.” They were apparently on their way to the city to collect donations for reconstruction work on the temple. Daihonzan Tofuku-ji is the head temple of the Tofuku-ji School of the Rinzai sect of Zen Buddhism. Originally established in 1236 and constructed between 1236 and 1255, it was destroyed by fires in 1319, 1334, and 1336. In the late 1350s it was rebuilt according to its original plans. When chancellor Kujo Michiie (九条道家, 1192–1252) established the temple, he was inspired by Todai-ji and Kofuku-ji, two major temples in Nara. Tofuku-ji’s name was actually created by combining the characters for To of Todai-ji and Fuku of Kofuku-ji. Although a fire once again devastated the temple in 1881 (Meiji 14), it was reconstructed. 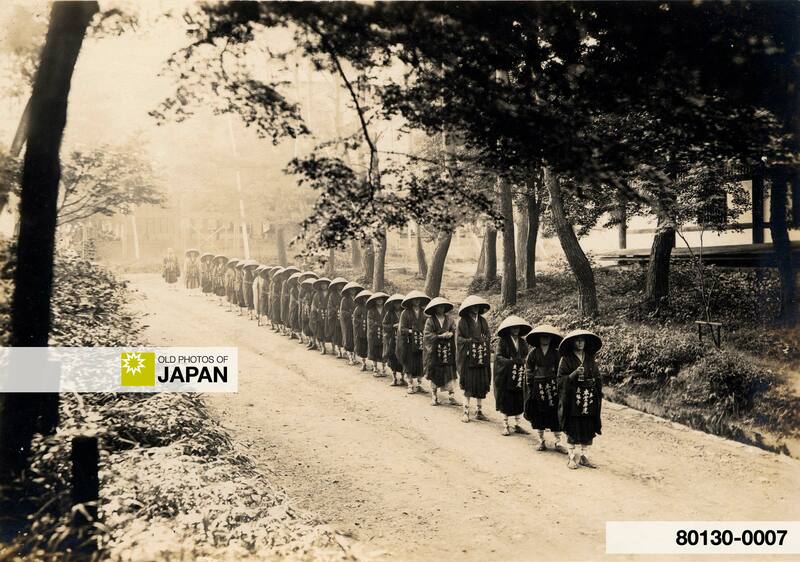 The reconstruction work took place over several decades and was finally completed in 1934 (Showa 9). This image is a wonderful historical document of some of the fund-raising that took place for this reconstruction. I haven’t found the exact location where this photograph was taken yet, so the Google map shows the location of Tofukuji. 1 Rinzai-Obaku Zen. Temple Name: Tofuku-ji 東福寺. Retrieved on 2008-04-14. You can also licence this image online: 80130-0007 @ MeijiShowa.com.